Scott Turner, a former pro football player and state lawmaker from Rockwall, Texas, was appointed as the executive director of the new White House Opportunity and Revitalization Council. “Scott, I want to thank you for doing such a good job, but your results hopefully in a year or two or three will be very well-suited. That’s when I’m really going to thank you,” Trump said in the Cabinet Room. 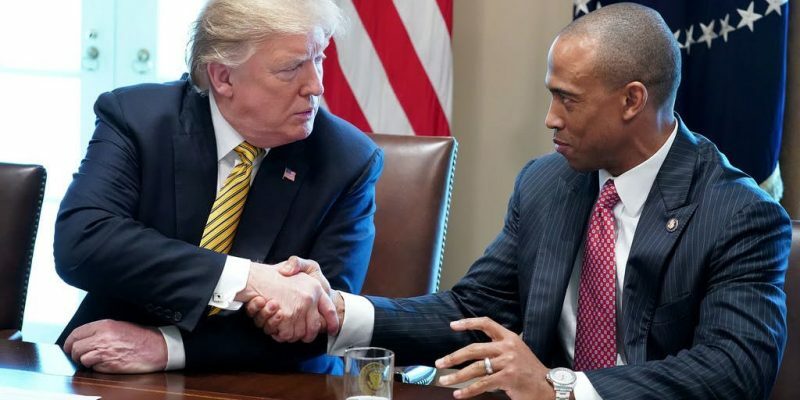 Trump signed an executive order in December to establish the council, which will target and streamline federal resources to Opportunity Zones designed to encourage investment in distressed communities. Turner, a Republican, served in the Texas House from 2013 to 2016. He played football at the University of Illinois and nine seasons in the NFL for the Washington Redskins, San Diego Chargers and Denver Broncos. During his NFL off-seasons, Turner worked as an intern for former California congressman Duncan Hunter. He accepted a full-time position with Hunter after he retired from football. In 2006, Turner ran an unsuccessful campaign to fill California’s 50th Congressional District seat. Turner grew up in Richardson and graduated from Richardson Pearce. He and his wife, Robin, live in Frisco and are members of Prestonwood Baptist Church, where he sometimes serves as a guest pastor.